University of Leicester Professor Sir Alec Jeffreys, inventor of DNA fingerprinting, has been named Great Briton of 2006 at a glittering ceremony held at London’s Guildhall last night (Jan 18). Over 500 dignitaries, royals and celebrities as diverse as Jerry Hall, Terry Gilliam, Damon Hill, Jane Seymour and Piers Morgan attended the third Morgan Stanley Great Briton Awards at London’s Guildhall. The awards are a celebration of outstanding achievements by great Britons during 2006. 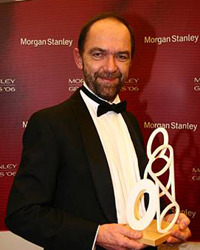 Professor Sir Alec Jeffreys took the overall title of Morgan Stanley Great Briton of the Year. Sir Alec attracted thousands of public votes and the support of the judging panel thanks to his development of the revolutionary technique of genetic fingerprinting. Professor Jeffreys had been shortlisted in the Science and Innovation category. But he not only won that but fought off competition across six other categories to claim the overall title. Among other category winners was honorary graduate and Distinguished Honorary Fellow Sir David Attenborough who won the creative category. Now in their third year, the Morgan Stanley Great Britons awards celebrate outstanding British achievement across seven categories: Arts, Business, Campaigning, Creative Industries, Public Life, Science & Innovation and Sport. Previous overall winners are Tim Berners-Lee (2004) and Lord Coe (2005). The Morgan Stanley Great Britons Awards are organised in association with the Daily Telegraph and Classic FM. Professor Jeffreys is no stranger to awards –he has been feted internationally since he made his discovery in a Leicester lab in 1984. Last year, Sir Alec, who is Royal Society Wolfson Research Professor in the Department of Genetics, was awarded the Dr H.P. Heineken Prize for Biochemistry and Biophysics 2006 by the Royal Netherlands Academy of Arts and Sciences in recognition of the discovery of the revolutionary technique. In 2005 he won the Lasker Award for Clinical Medical Research- the Lasker Awards are the US's most distinguished honour for outstanding contributions to basic and clinical medical research, as well as public service on behalf of the medical research enterprise. He has previously been awarded the Davy Medal by the Royal Society in 1987, a Knighthood for services to genetics in 1994, the Australia Prize in 1998 and the Louis-Jeantet Prize for Medicine in 2004. Amongst a host of other awards are a number of honorary degrees and the Freedom of the City of Leicester. Sir Alec studied biochemistry and received his PhD in 1975 at Oxford University. He then joined the laboratory of Piet Borst for a post-doctoral research at the Department of Medical Enzymology and Molecular Biology at the University of Amsterdam. In 1977, he joined the Department of Genetics at the University of Leicester where he became a professor in genetics in 1987. Sir Alec has been a Fellow of the Royal Society since 1986 and the Royal Society Wolfson Research Professor since 1991. He is also a member of EMBO, of Academia Europaea and of the American Academy of Forensic Sciences.